Northern pike (Esox lucius linnaeus) are at home in many of the lakes, rivers, and sloughs of Alaska. It is in our opinion one of the most underrated sport fish in Alaska. We have fished around the world for Mongolian Taimen, and Brazilian Peacock Bass, (two of the most renowned freshwater topwater strikes out there), and the Northern Pike is just as aggressive. There is nothing more exciting than watching a 47 inch pike waking behind your mouse pattern before he engulfs it four feet from the boat. At Alaska Royal Coachman Lodge, we fish a wide variety of locations and specialize in mapping out your day of fishing in advance. The Northern pike is a unique fish that can be sought after exclusively or for just a few hours a day. Often there is a shallow bay that has good numbers of pike that is not far away from your primary target fish, which may be rainbows, char or salmon. You’re in for some exciting action if you have never caught a northern pike on a fly-rod. We recommend this experience. On sunny days you can expect to sight fish the “big guys” in the shallows just like bone fishing the flats of the Bahamas. With maybe a FEW more mosquitoes! If you’re a “die hard” adrenaline junky and simply love to chase big fish, then our trophy pike waters are for you. We offer action packed days of heart thumping, water erupting, finger bleeding fun, only experienced at our lodge! 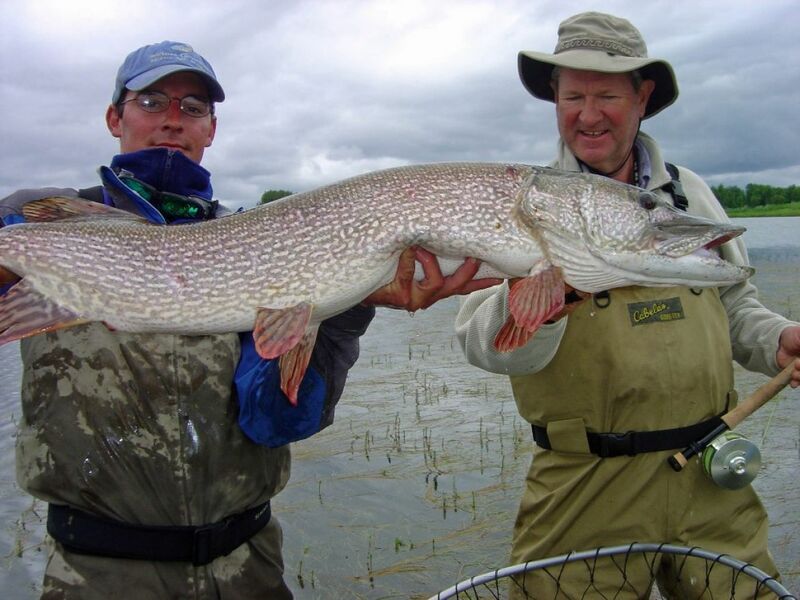 Pike up to 10 pounds are common in our Alaskan rivers, lakes, and sloughs, and fish weighing up to 30 pounds and measuring over 4 feet in length have been caught by anglers fishing at Royal Coachman Lodge. They love mouse patterns and have one of the most aggressive topwater strikes in freshwater. The Royal Coachman Lodge specialty is having a variety of fishing opportunities. The Northern Pike surprises more fisherman than any other. Guests will often come for the salmon or trout fishing, but the memory of a 20lb pike smashing their fly is in the forefront of their memory at the end of the trip. Why go to Canada to catch Northern Pike all week when you can have trophy Northern Pike fishing alongside some of the best trout, salmon, and char fishing in the world! Variety is the spice of life and at the Coachman you will have a tough time choosing what to do. 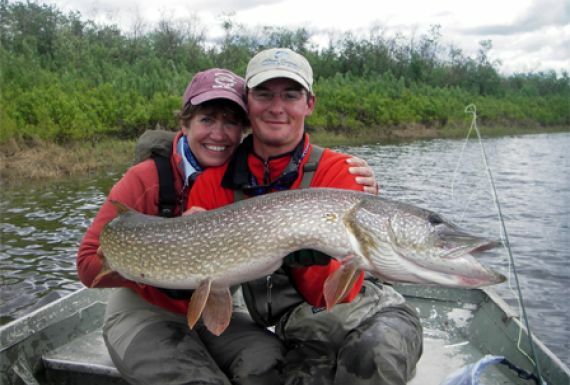 Come to our Alaska fishing lodge for some of the best Northern Pike fishing in Alaska!